In The Way It All Works, bestselling author John Eldredge shows how we labor under the misconception that prayer is asking God to intervene instead of partnering with him to get things done. This faulty assumption leads to untold confusion and grief when we ask of God but can't sense He hears us--or even cares. Rather, Jesus says, "I will give you the keys of the kingdom of heaven; whatever you bind on earth will be bound in heaven, and whatever you loose on earth will be loosed in heaven" (Matthew 16:19). When we operate from this position, we approach prayer with far greater confidence. We understand we have a role in making change happen and are not victims of circumstance--that we are sons and daughters of God bestowed with tremendous authority. 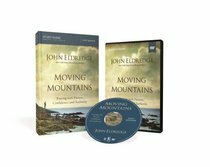 About "Moving Mountains (Study Guide With Dvd)"